Chinese vendor Proview apparently owns rights to the iPad trademark in China, and it has two billion reasons not to honor its prior agreement with Apple as the Wall Street Journal cited a representative of Proview creditors who suggested compensation from Apple “could range as high as $2 billion,” which is up from the previous sum of $1.5 billion. Cash-strapped Proview recently filed for bankruptcy, so courts could interpret this as banks’ last-ditch effort to recoup their loans to Proview. A Hong Kong court ruled last year that Apple’s agreement with Proview was valid, but that case is still pending on the Chinese mainland. Court documents uncovered by Dow Jones suggest on Dec. 23, 2009, Apple of California bought the rights to the iPad trademark from Proview in South Korea, Thailand, Singapore, and China for a paltry sum of about $55,494 in today’s dollars. Proview waived its right to sue for past infringements and passing off. Proview said it still owns the trademark and maintains the deal did n0t include the China market. Another court in Mainland China sided with Proview, thus paving the way for a potential injunction on both the import and export of iPads. The world’s largest contract manufacturer, Foxconn, is exclusively manufacturing Apple’s tablet in China. Proview chairperson Yang Rongshan said today: “If we are not compensated properly, then Apple doesn’t use the iPad trademark in mainland China.” Shenzhen-based Proview, once a well-known monitor vendor, claimed it started developing a product called the iPAD in 2000. iPAD stands for “Internet Personal Access Device.” So, what does Proview’s iPAD look like? Images are right after the break. Apple argued Proview is purposefully refusing to honor the agreement to push Apple into an unnecessary trademark licensing agreement. The company said it “bought Proview’s worldwide rights to the iPad trademark in 10 different countries several years ago. Proview refuses to honor their agreement with Apple, and a Hong Kong court has sided with Apple in this matter.” Despite local customs’ stance that implementing a countrywide ban on such a globally popular product is impractical, authorities in more than 30 Chinese cities have removed the device from retail stores. 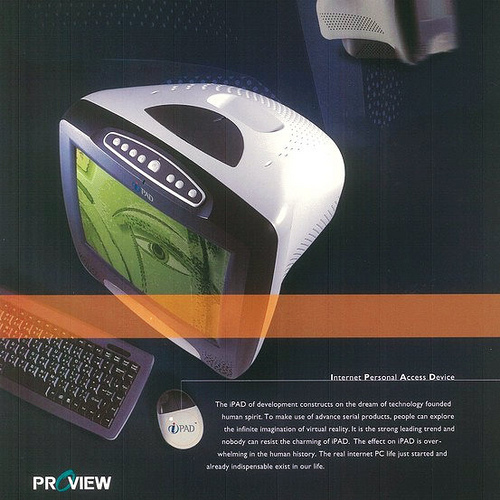 Proview’s iPad device from 2000 looks a lot like Apple’s iMac. 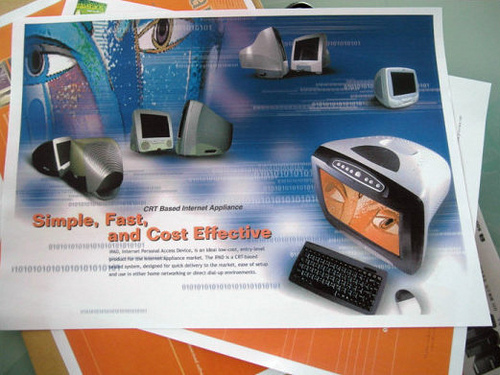 They made from 10,000 to 20,000 units between 1998 and 2000. Image courtesy of MIC Gadget.